1. Keeping it Neutral. The neutral paint and grown-up furnishings make this an elegant bedroom your little daughter can grow with. Soft toys and playful prints cater to her kiddie whims. 2. Colours and Prints Everywhere. Your daughter will love the whimsical appeal of this bedroom with its wallpaper (same style, different colours) and mix of prints (coloured stripes on the chairs, floral patterns on the rug and bedspread). The metal bed and nightstand add a rustic touch. 3. Quirky and a Li'l Eclectic. Prints and patterns in different hues and styles give this bedroom a Bohemian and charming vibe. Dollhouses on the table and dresser mean serious playtime. 4. Built-In Beauty. Ask your interior designer or contractor to create a customised built-in bed with ample storage space for your daughter's toys, clothes, books, and other belongings. Distressed table, wooden chairs and cabinets, and baskets provide this bedroom with a warm and cosy feel. 5. French and Fabulous. Give your little girl's bedroom a rustic French makeover. Use matching gingham prints on the bed, upholstery, and wall decor, and furnish the bedroom with cabriole-legged furniture and ornate shelves. Add fresh flowers for a girlier touch! 6. Luxuriously Pink. This locally designed bedroom is committed to the colour pink, smart storage, and soft furnishings. A cushioned bay seat window is used to display soft toys, and the patterned wallpaper and chandelier exude luxury perfect for your little princess. 7. Shared Space for Sisters. A baby cot shares a space with the grown-up sister's bed in this bedroom of a 5-room flat. Different shades of pink, Hello Kitty toys and wall decals, and customised floating shelves and built-ins accommodate both their needs and wants. 8. Toy Wonderland. What will delight your little girl more than being surrounded by her toys in her bedroom? This small bedroom makes use of wall storage to display toys, books, and other cheerful accessories. The medley of colours in this space? Simply dreamy. 9. Royally Radiant. 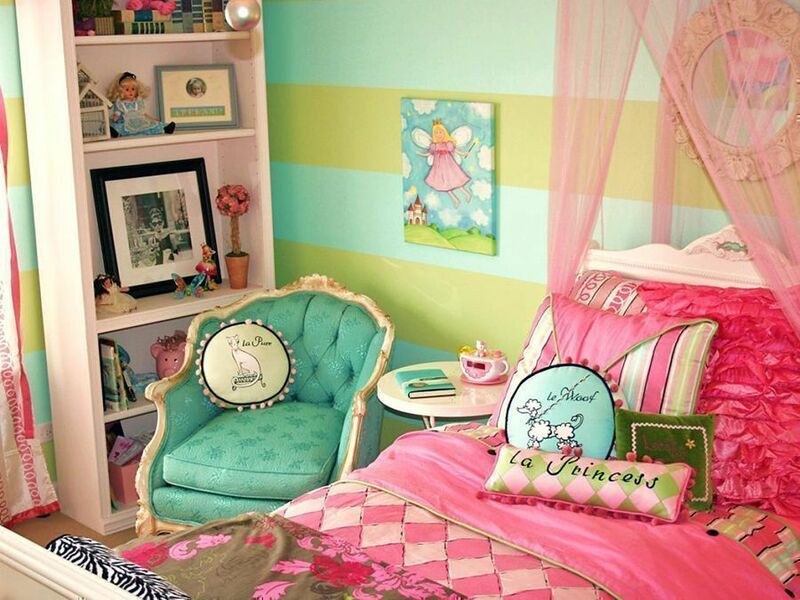 Budget notwithstanding, give your daughter a bedroom that will make her feel like a princess. Furniture pieces and furnishings—ornate bed, chandelier, built-in shelves and bay window seating with decorative wood trims, and matching dainty prints and decals—work together to summon a majestic feel. 10. Loft it Up. Get your contractor to make a loft bed—complete with stairs!—in your child's bedroom. Use the space below for her study table and toys, and aim for a country-look for a more charming appeal. Check the bedroom designs for boys here. Look for a designer to create your child's dream bedroom. Check for kid's bunk beds here. Loving your child's bedroom? Share stories and photos with us at hello@cromly.com. Like us on Facebook.